Fair enough these are youth games, but what no one can deny looking at this is, he's got so much skill. Reminds me of Taraabt. Definitely worth a gamble like to be fair, looking forward to him breaking in. To be fair we've got a decent record with french younguns who come from no where, look at Bernard and Charlie. i honestly can't tell which player i'm supposed to be watching. I was watching this video on youtube, it was highlights from Ba's entire career - even since he was playing in Africa. There was a lot more than just goals and assists: they had edited down full games to show just Ba's touches. He looked a level above the players he was amongst and against. It was really a comprehensive document of Ba's career. Then I realised after 15 minutes it was Ibrahima, the wrong Ba. We should sign him anyway, he looks a top player. He's retired man! Played for Milan then he went a bit shite. I think he was being sarcastic. Gullit tried to sign him iirc. Read the first line, and that was it. Aye he did, sure he played in England for a bit too. He does look good on the video. I watched a fair bit of it before I realised that the bloke we had signed was called DEMBA Ba. Abeid looks alright, would have been nice to see some of his goals/assists. How's Vuckic doing? Everyone was raving about him and Milan scouting him etc. Bolton, according to wiki ('03-'04). Can't remember that at all though in all honesty. He was good on ISS on the N64. Was it him who had green braids in his hair? Aye. And Gullit tried to get him on loan too I think. Ba's hair was dyed blonde. Did West not play for someone in this country as well? He had a short spell at Derby and an even shorter spell at Plymouth. He used to be class on one of the champ man games, at the very start of the game you could get him on a free! Might have been 98. I can't recall! Other than that I've only seen him play in world cups. I remember in 98 when Nigeria finished top of their group and I seen the shirt in a sports shop my uncle said he would get me it if they won the competition, I was young and naive enough to think they might have had a chance. It was a lush top though! Nigeria were class in the '94 World Cup. Probably a bit before your time (ffs! ). He was quality (at times) for Inter as well. Just a bit before my time but I can't imagine England not being involved helped many kids at the time! 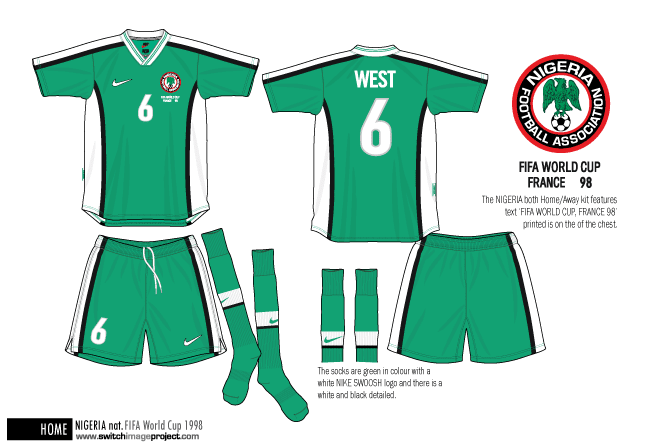 I always enjoy watching Nigeria, it probably all stems from that childhood memory and the fact the kit is nice! Was it Sunday Oliseh from Nigeria who scored that screamer in the 98 World Cup? It was a canny World Cup all the same as it happens. Probably partially due to not having to deal the disappointment of England valiantly losing against the first decent side they played in the knock-out phase. Dreadful final mind. Probably could have won the whole thing if it wasn't for that lost minute equaliser off the those horrible flukey pizza scoffing cunts. That game in Nantes too in 98 against Spain was an all time WC classic for me. Probably partially due to not having to deal the disappointment of England valiantly losing against the first decent side they played in the knock-out phase. Yeh I've heard the same from a few people. I can imagine it would take a bit of strain off the tournament. Everyone repeatedly gets wrapped up in the England hype. It's difficult not to be. Probably could have won the whole thing if it wasn't for that lost minute equaliser off the those horrible flukey pizza scoffing cunts.That game in Nantes too in 98 against Spain was an all time WC classic for me. Aye, Baggio absolutely carried that side.